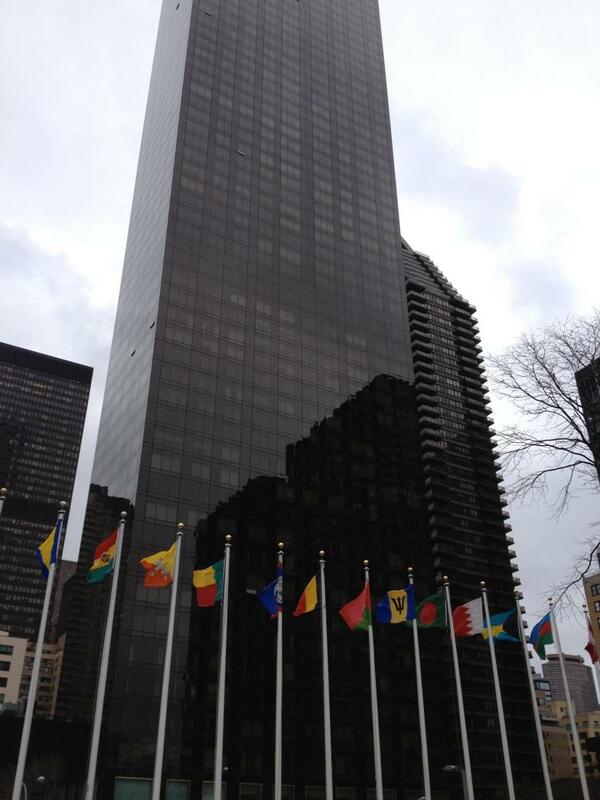 (WNN) Santa Rosa, California, UNITED STATES, AMERICAS: I loved everything about New York. The taste of lox and bagels. The Oyster Bar at Grand Central Station. The call of the vendors. The conversations of the street sitters. The brash beautiful light shining on everything. The honking of horns and ringing of bells. 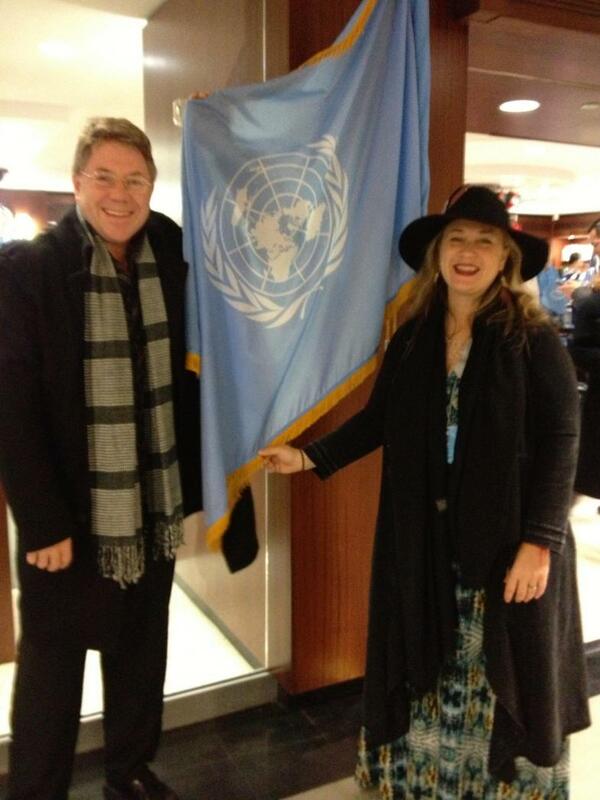 But it was the sight of the United Nations flags that called me to the very core of my hope-filled heart and rocked me. I made it. In the strangest possible way I felt home. I have no information as to why I felt that way other than I knew I was supposed to be there. All my life I have wanted to be a part of ending violence against women and I seemed to feel that I had landed in the epicenter of what was possible regarding the thing I cared most about. On the last day of the UNCSW – United Nations Commission on the Status of Women I found myself in the UN gift shop in where I was amused and blessed. Amused at the ridiculous almost ‘camp’ import products including shot glasses with the logo for the UN proudly displayed in gold (yes I got two), and the bright blue to-go coffee mugs, (yes I got two) even though there was not a cup of coffee to be found in that place. And I was blessed to find just the right number of copies of the UN Universal Declaration of Human Rights. I bought every copy I could find. Gathered them up like treasures. I was grinning so wide that the lady at the counter treated me as though I was rather crazy. So I told her: I am teaching at a conference just a few days later with 40 women and girls back in California at our school and we are going to read the Declaration out loud in a circle. I felt a sense of true joy at acquiring this most sacred of documents. Precious indeed. Clutching them to my breast I felt I was a part of something bigger than myself and could bring that back to my community. Yes, there was hope. Pride bigger than my own country patriotism. I was standing on sacred ground – the very geography that represented the NATIONS, not just the United States. Ours was a declaration which every country had signed that says such powerful words as: “All human beings are born free and equal in dignity and rights.” Yes. Yes. Even though we weren’t living up to that standard in our world, there it was, written in black and white for all to see and agree, a standard by which we would measure our behaviour. I was there to participate in the 57th year of the Commission on the Status of Women. In a panel hosted and sponsored by WNN – Women News Network, along with MADRE, WUNRN (Women’s UN Report Network) and WIN (Women’s Intercultural Network) as contributing partners, I shared a video that showed the work of 43 women artists from across the world who have been creating artwork by and about women. This artwork was designed to highlight the work they had done toward personal healing and intentional creativity. The video demonstrated how healing art post trauma was working to transform women’s lives who are now re-visioning their personal life stories. This is my own personal work, to guide women to revision their experience of themselves and their stories through image and language. It is critical that we take responsibility for how we experience ourselves, speak to ourselves, and ultimately how we behave in life. All of this is designed to give women the tools to speak about as they image themselves on the deepest levels. My experience at the UN and what I was learning from the presentations was lighting me up and re-igniting my desire to be a part of the global movement of healing and ending violence against women. I felt the possibility all revolutionaries live by – that change is possible if we stick with it and don’t give up. On my last day at the UN I was able to attend one of the larger sessions and as I sat behind a country placard with no one in the seat, I listened and imagined, What would I say to Madame Speaker if I was given the chance? I pretended she would call on me and I would say my point. To find out what I would say, keep on reading this article over on WNN. To Sign the Petition – A Movement to Revise the Declaration of Human Rights to be Gender-Inclusive, click here. Your signature will help bring this cause to the United Nations. 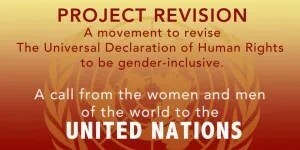 Project Revision is A Movement to Revise The Universal Declaration of Human Rights to be Gender Inclusive. I am so excited to share this with you. Since going to the UN last year I have been so lit about about creating this petition and feel so blessed to work with Lys Anzia at WNN to make it happen. Jonathan and I will be attending this year as WNN Press due to our articles and photos showing up in WNN. As an artist, poet and activist it feels ridiculously important for me to work on projects like this – and the Color of Woman Graduates, who are called the Red Thread Nation are a part of making it happen. I will keep you up to date on our progress as the time unfolds on this journal to transform this sacred book to benefit the language and lives of women, and the men they love. AND FYI at the roots this in not a women’s cause, this is a human cause. I am up super early, 3:30 am and was filled with a desire to tell you about this. I lit the fire and cuddled up with my ‘foofy” which is my fuzzy blanket and my new stuffed elephant, from Jonathan (he named him Wooley Booger, not me), and while on the way to save the world something soft and fuzzy caught my eye and so here I am enjoying comfort, while reaching out to YOU to walk with me to bring more balance into our world. When I was a young advocate I had my angry times, my rants and raves. I am not operating in any form of anger when I work for what I believe. I am am truly operating from a ridiculously hopeful LOVE. P.S. I will be teaching on March 22 & 23 in New York, I rented a giant artist loft in Little Italy, if you want to come and paint, write, red thread circle and explore the hidden TABOOs in your life over bowls of spaghetti and glasses of red wine then come on over. I will also share with you about my journey to the UN since we will be there starting on March 19.